Next week I will be returning to Nerd Mecca and one of my first destinations will be nuzzled in between Bandai, Cartoon Network ,Netflix (like my heart) and The Loot Crate booth. If you followed me last year, either on social media or in a stalker way (don’t worry either is fine) you will know that this is one of my favourite booth’s, especially since it was designed to look like a giant Loot Crate. Now you’re probably wondering, what can I get at this booth? EXCLUSIVE Rick & Morty Figure – Limited Quantities! – During the run of the show, they will be featuring a limited daily amount of an SDCC Exclusive, Numbered Rick & Morty Variant figure – the very first con exclusive collectable designed and manufactured by Loot Crate. Loot Crate will once again be including an Interactive Photo Booth, where you can take your picture on a rad digital backdrop and receive your photo via email right away! If you’re a Looter, you can once again swing by the booth for a FREE Looter gift, either by showing your Looter Membership Card or, if you don’t have it on you, an email you received from Loot Crate will do. They will be taking signups for new members all weekend, as well – and if you make any kind of purchase (exclusive figure or a subscription) at the booth using your Mastercard, they have a special gift for you of one of their classic tees from Loot Crate’s past assortments. The Loot Crate production team will be at the booth periodically to film some testimonials from fans of Loot Crate. And to make things extra exciting, they will be scanning badges to enter you in a raffle for a very awesome prize. Loot Crate will be featured as part of FYE’s Pop-Up Shop at the Westfield Horton Plaza – Suites 133 & 136, located five blocks north of the Convention Center at 324 Horton Plaza. They are also working on other exciting events for the FYE space, which have yet to be announced. 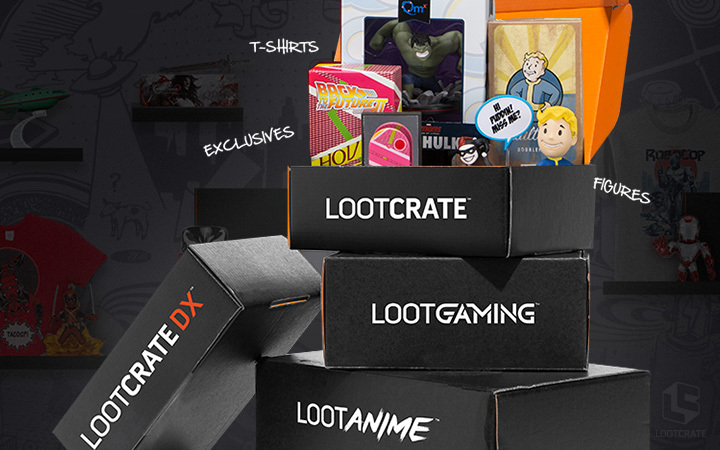 What can I say I am a firm covert to Loot Crate and can’t wait to get me some LOOT.